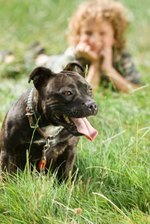 It's important to know that the term "pit bull" is often used incorrectly to describe several breeds of terriers: American Staffordshire terriers, Staffordshire bull terriers and bull terriers, as well as American pit bull terriers. However, the American pit bull terrier is the only real pit bull. There are several physical characteristics that will help you identify a real pit bull puppy. Even as a puppy, the head of the American pit bull terrier is square. Pit bull puppies have loose skin around their heads, making their heads look wrinkled. As they grow, the wrinkled skin stretches out over the cheeks and thick neck. The pointed ears fall forward and remain that way unless they are cropped. Many pit bulls have faces that are white with light brown or chocolate brown circles around one or both eyes (think Petey from the "Little Rascals"), or faces that are dark brown with a white stripe starting between the eyes and stretching down the nose. Pit bull puppies are about 10 pounds and 8 to 12 inches long at birth and grow to be 35 to 55 pounds and 18 to 22 pounds in adulthood. Puppies have short legs, a small, pointed tail and larger chests and broader shoulders than most other puppies of the same size. Although their coats are thick, American pit bull puppies' hair is extremely shiny and can come in a wide range of colors. Puppies can have coats that are one, two or three colors, ranging from tan, brown and "blue" to brindle. The coat remains thick and shiny into the dog's adulthood and is easy to groom. Pit bulls do shed, but you'll rarely find large clumps of hair balls.